A new semester will soon begin as I write this and my thoughts obsess over inspiring and motivating my students. It’s hard for me to believe I’ve been teaching since about 1999. I should be seasoned and secure in my teaching philosophy. Yet nothing concerns me more than motivating and caring for my students. The coursework comes easy but the technique in the classroom is something I’ve always struggled with. And I’ve aspired for years to act more aggressively as an advocate for my students. I remember years and years back in an intro to education course watching a film with my fellow group members–a group of young and idealistic teacher-wannabes assigned to write on teaching styles. We watched Dead Poets Society over pizza and sodas in a dorm meeting room. And because I was young and capricious and uncertain what I wanted to do with my life–I mean one semester prior to this I was an engineering major thinking I would take all math and science courses–I found myself dismissing the film as sentimental and over-cooked. I was angry and young and stubborn at the time. And then I tutored for a few humbling years and found my way to the composition classroom. 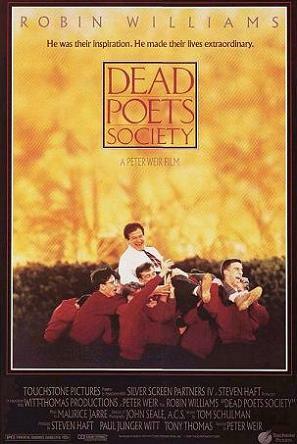 I returned to the film recently because of Robin Williams’ death and found myself captivated in the representation of the instructor-student relationship. I found the film to be a very strong representation of how a teacher can struggle with administration and also struggle with students. How a teacher has to face challenges from within and from outside the classroom. Williams’ character is kind and patient as well as firm. The scenes I remember most fondly are the scenes where Williams’ character pushes his students to feel empowered and to think independently. These are the moments early on in a term when I am reminded of teachers who have inspired me–gone above and beyond to help me. Will Hochman from the University of Southern Colorado, Lisa Ede and Tracy Daugherty at Oregon State and most recently Sergio Troncoso from the Yale Writer’s Conference.